MTech USA Bottle Opener With Mirror Blade | BUDK.com - Knives & Swords At The Lowest Prices! 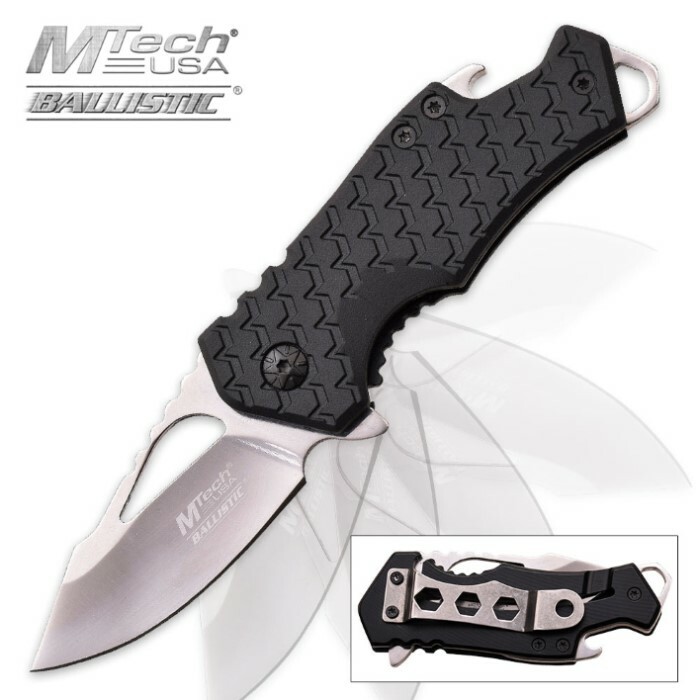 The MTech USA combination spring assisted folding pocket knife and bottle opener is one handy little tool to have around. Just slip it in your pocket or camping gear or vehicle. You will want to carry it everywhere! It has a 2 3/4” stainless steel blade with a mirror finish. The nylon fiber handle is durable and has a bottle opener. This knife and bottle opener has a pocket clip so that you can carry it anywhere. It is 3” closed and comes in black or blue. This is a well made smaller knife. Cracks right open, not loose, has a fair amount of weight to it, very clean. Should've brought two. ?? Definitely recommended. First let me say that I love this little knife and I recommend to anyone for an everyday carry. I purchased mine in the black color and for $5.99 I feel like a thief. The spring assist is good enough but not crazy fast. The blade is rock solid sturdy and I can't get it to wiggle at all. Edge was pretty good out of the box. Bottle opener is a great feature and I could see someone sanding down the lanyard hole into a flathead screwdriver? The only thing that upsets me even the slightest is the size of the blade eject button being a little small. If I keep flipping it open, after the 10th time my finger starts to hurt. I highly recommend this knife to everyone I absolutely love it. Mtech makes some good stuff!